So relaxing entering this unique seaside townhome. Comfortable living room upstairs with open concept to the kitchen and middle deck, perfect for your morning coffee. Cozy TV room with HBO/SHO and of course internet, all the convenience for a memorable getaway. An expansive lower deck leads to the lush courtyard, yours to enjoy along with the lap pool open in season. You'll spend time on the rooftop deck with panoramic views of the lighthouse and the Bay of San Felipe. You are safe and secure in this gated community including a one car garage. Private stairs lead to a sandy beach where you'll beach comb for hours. This area has one of the most tidal in the worlds with more than 23' range, at the lowest of tides the hotsprings are accessible under the lighthouse. It's walking distance to town and all that the Malecon offers, restaurants and entertainment just 10 minutes away. Plenty to explore here or just relax and have a massage and a wine. This quiet retirement community is open to adults of all ages being respectful of the rental contract. Originally from Seattle, our family has been coming to San Felipe since the 1970's. We purchased this property and started developing in 2000. 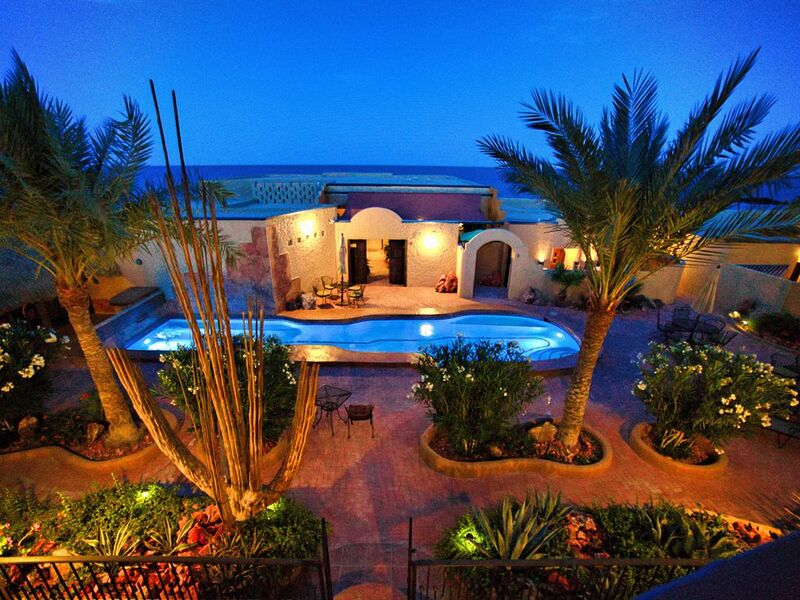 Living here since 2007 and loving San Felipe and its relaxed lifestyle. My wife and I spent a weekend here. It’s a short walk to the downtown boardway. The room was great, very roomy. The sunrise view from the living room was beautiful. Can not wait to return to this property! Gail and Michael were pleasant and accommodating. The location is spectacular. It's quiet, yet an easy walk downtown to shops and restaurants. We loved the private beach in the moonlight. Great accommodations a step from the beach. Stayed in #2 for a few days while relaxing in San Felipe. Took in the local culture. Found some great food with the helpful recommendations of Michael and Gail. Great hosts ready to help with what ever you need. Looking forwad to a return trip. Michael and Gail were wonderful! We had a fantastic time and we will definitely be back. Our first time to SF. Gail and Michael are great hosts. Will be back some day! Wonderful location, beautifully appointed, quiet and relaxing. Gail and Michael were excellent hosts--we'll likely return in the fall or spring.